If you’re thinking about buying in the Scottsdale area, it seems like there won’t be a much better time than now. We are hearing more and more about different luxury plans to build in this area, making current property values on the precipice of becoming sky high. Make a smart investment in this budding area with Attorney’s Realty. The developer behind plans for a $2 billion Ritz-Carlton resort community in Paradise Valley wants to build a luxury shopping center next door in Scottsdale featuring boutiques, restaurants, offices, high-end housing and another hotel. City planners have nearly finished their initial review of the project designs, but dates have not been scheduled for the required public hearings and council vote, said Tim Curtis, Scottsdale’s planning director. The Palmeraie would develop in two phases, starting with eight buildings along Scottsdale Road across from the Sands North townhouse complex. Conceptual renderings show palm-lined streets and sidewalks, festive lighting, courtyards and modern architecture with stone and glass facades. A central plaza will provide space for restaurant patios, public gatherings and outdoor events like art festivals, according to Five Star. Underground garages will provide most of the parking spaces. Five Star plans to start construction in the third or fourth quarter of this year but did not give a projected opening date. 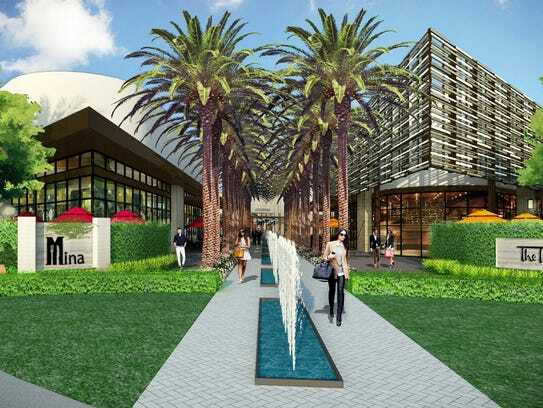 Dolce Vita Development, the company handling leasing for the Palmeraie, said it expects to announce future tenants later this year.The first phase includes space for about 60 shops, 12 restaurants and 32,000-square-feet of second-story office space with balconies, according to Five Star. A second phase likely would include a gourmet grocery store, luxury residences and a boutique hotel, according to the developer. Five Star said it is consulting with Hanna Struever, founder of California-based Retail Portfolio Solutions, to build a mix of tenants. Struever also has worked on the historical Highland Park Village shopping center in Dallas, which features brands like Hermes, Chanel and Dior. Can luxury shops thrive in Scottsdale? A conceptual rendering shows the proposed design of the Palmeraie, a luxury shopping development planned near Scottsdale and Indian Bend roads, next to a new Ritz-Carlton resort. Scottsdale and neighboring Paradise Valley boast some of the wealthiest demographics in metro Phoenix, but it remains to be seen if the area can support a shopping center primarily featuring luxury stores. Although Scottsdale Fashion Square is home to high-end brands like Bulgari, Prada, Tiffany & Co. and Jimmy Choo, the mall also includes more affordable shops like Gap, H&M and Charming Charlie. Luxury department store Barneys New York shuttered its location at the mall this spring. Scottsdale Galleria launched in 1991 as a luxury and specialty shopping destination, but it faced foreclosure after just two years. The anchorless luxury mall in downtown Scottsdale had space for about 150 stores. The Galleria drew the Phoenix area’s first IMAX theater and Arizona’s first California Pizza Kitchen restaurant and Vidal Sassoon salon. In 1993, the $126 million complex sold at a foreclosure auction for just $6 million. In recent years, the Galleria has found new life as an office hub, now home to regional offices for tech companies like Weebly and Yelp. The planned mix of shops, offices and residential units makes the Palmeraie more comparable to Kierland Commons or Scottsdale Quarter, which have enjoyed success in the Scottsdale Airpark area. The Palmeraie presumably would benefit from close proximity to tourists at the new Ritz-Carlton resort and other nearby hotels. The Scottsdale Plaza Resort, Hilton Scottsdale and the McCormick Scottsdale are all less than a mile away. The shopping center could also benefit from local residents with more disposable income. Paradise Valley’s median household income of $134,000 is more than double the state’s median of about $50,000, according to census figures. Scottsdale’s median income is about $74,000 per year. A $2 billion Ritz-Carlton resort and luxury residential community are expected to break ground this spring after getting the green light from the Paradise Valley Town Council. Construction of the Ritz-Carlton Paradise Valley resort and residential community is scheduled to begin this summer, when crews will begin grading dirt and digging out parking garages, according to Five Star. 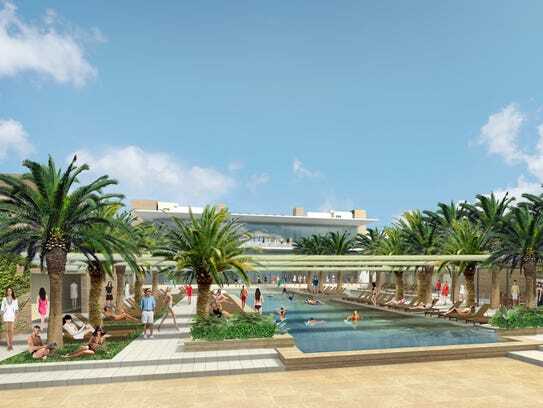 The hotel is expected to open in late 2018 with 200 “casita-style” hotel rooms, separate pools for adults and families, a spa, a garden with seasonal produce harvested for on-site restaurants and a citrus orchard. The hotel will cover about 20 acres near the northwestern corner of Scottsdale Road and Lincoln Drive, with a grand lawn that offers views of Camelback Mountain, perhaps the Valley’s most iconic landmark. Its main pool will stretch roughly 400 feet, perhaps the longest swimming pool in North America, according to the developer. Since the Ritz-Carlton Phoenix closed in July, the Valley is left without a Ritz hotel property, despite its status as one of the nation’s premier resort destinations in the winter months. That should change when the Paradise Valley Ritz arrives in late 2018.Surrounding the resort, Five Star plans to build 139 homes, ranging from 1,700-square-foot villas to 6,000-square-foot houses. The master-planned community includes 45 Ritz-Carlton-branded houses, which will offer access to hotel amenities, a concierge and services like in-home dining and housekeeping. Ritz-Carlton is owned by Marriott International, which is the parent company of Gaylord Hotels and well-known Marriott brands like Courtyard and Residence Inn. Ritz-Carlton currently boasts 91 hotels in 30 countries and 35,000 employees.